Anyone else get frustrated when their week doesn't go to plan? That was my life this week. Nothing crazy was planned, other than hoping to have a productive blog and work week, getting in my usual workouts, and relaxing at home. But then Tuesday I woke up with some crazy back pain that resulted in back spasms most of the day and not being able to bend over. Always fun when you spend 8 hours of your day sitting in a desk chair. Thanks to talented massage friends, a trusty heating pad, and pain reliever, I'm (slowly) on my way to normal. As someone who is always go, go, go from the time I wake up in the morning, it's been a challenge to not set my early morning alarm and just let my body rest. If it weren't for the fact that I physically could not do a workout if I tried, I'm sure I would have been trying to push my body before it was ready. Fingers crossed that this time next week I'm back to my normal workouts and this back pain is a distant memory. 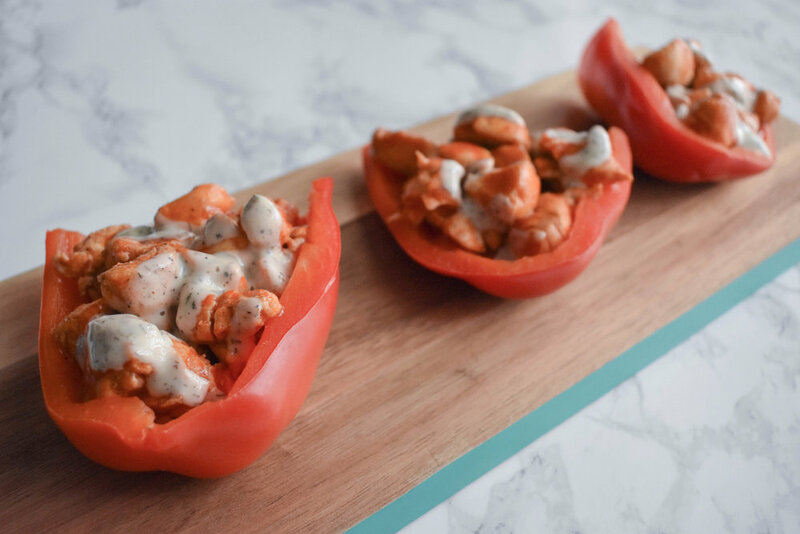 Something that did go to plan this week was these buffalo chicken stuffed peppers. Since I'm giving this whole paleo thing a try, I'm getting creative in what vehicle I use to eat my food. 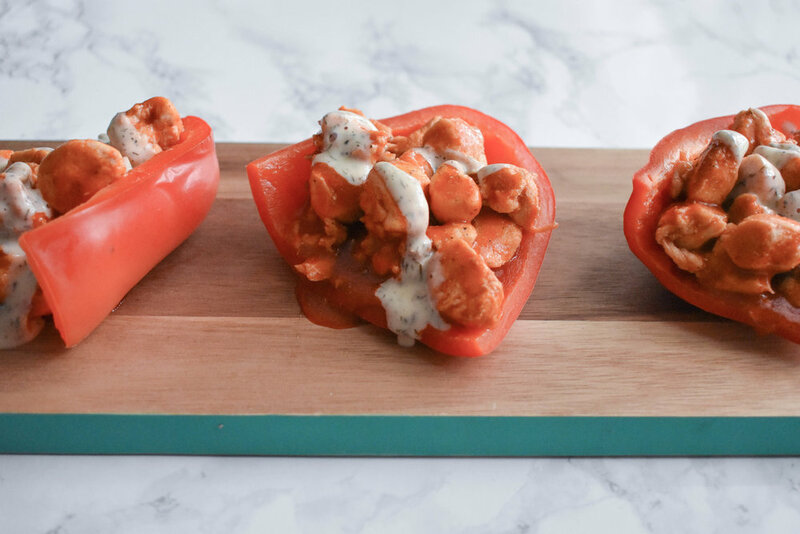 The red pepper was the perfect pairing for the buffalo chicken, and not just in color. Soft enough to not need a knife (because eating it with your hands is way more fun) but also a solid enough base for the chicken. 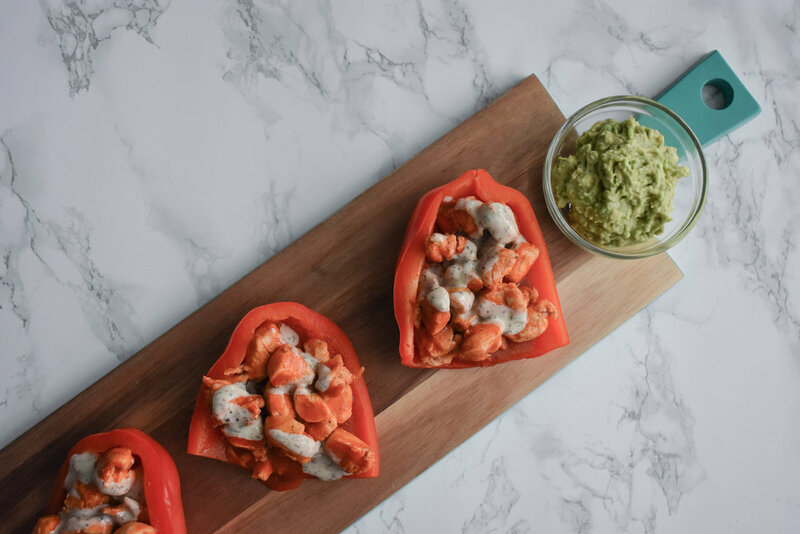 Topped with some cool lime guac to help tone down the buffalo, this dish is quick and easy but still packed with heat and flavor. Preheat your oven to 350 degrees. 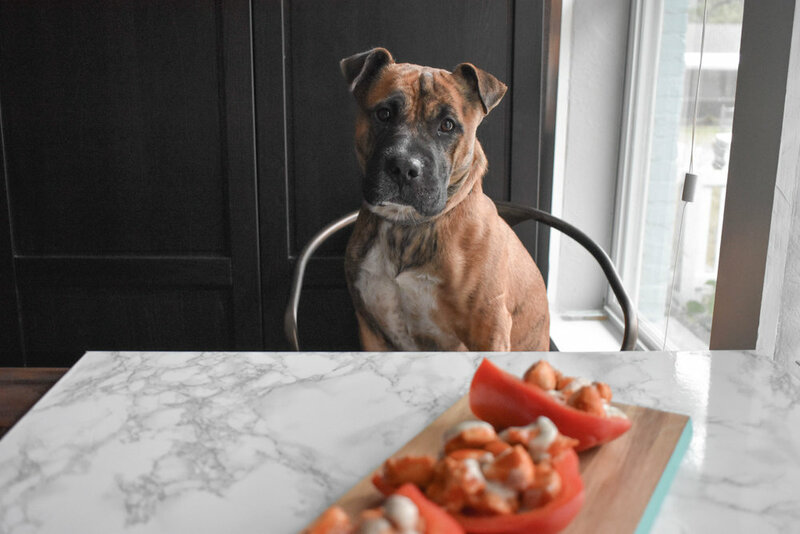 Remover the stems from your red peppers, slice in half, and remove the seeds. Place the peppers in a large pot of boiling water and allow to cook for 10 minutes. In a bowl, combine the chicken, buffalo sauce, and garlic powder. Remove red peppers and place on a baking sheet. Stuff the peppers with the buffalo chicken mixture. *If not paleo, feel free to top with blue cheese crumbles before placing in the oven. **I also topped ours with a dollop of mashed avocado and lime juice.